Apart from text, images are probably the most commonly used objects in Scribus or any other layout application. 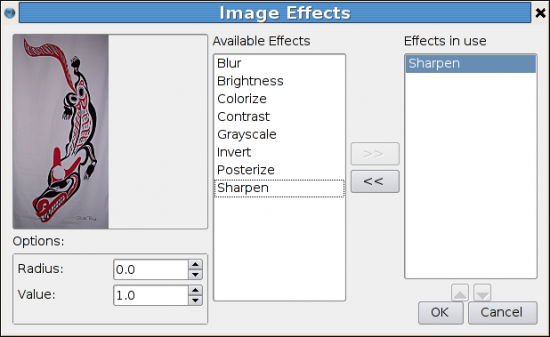 The basics of working with images in Scribus are mostly straightforward, but there are some methods and resources that you might miss, especially at first. Like any other object, images in Scribus are placed in frames that are visible when you click an image, and that include six control points to help you move or manipulate the image. For images, the frame is color-coded red, but otherwise image frames work much like any other frame, being movable either by dragging with the mouse -- preferably with the grid turned on -- or by adjusting its properties by entering exact figures. Just like any frame, image frames can also be locked to prevent editing, moved to another layer, altered in shape, exported to PDF, or copied to the Scrapbook for use with other pages or project. Most of the unique options for an image are available in the context menu that pops up when you right-click anywhere within the frame. They include options for both adding a new image and for editing an existing one. 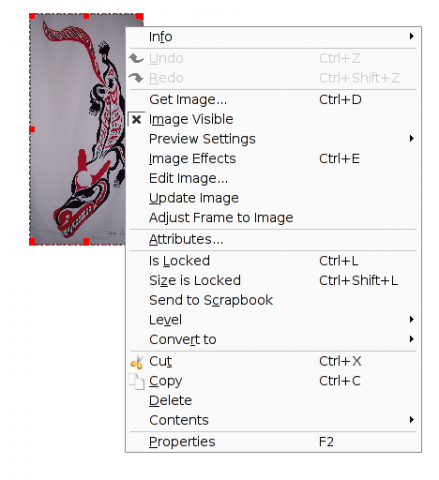 Scribus gives you several options for adding an image and its attendant frame. You can, of course, copy and paste from within Scribus, or select Windows -> Scrapbook and drag an image from the Scrapbook into a document. However, the most common method is to select Insert -> Image Frame or press I, and then draw the frame by dragging with the mouse. You are left with the visible frame with an X through it. From there, right-click in the frame to display the context menu, and select Get Image to select an image in a file-manager. Scribus supports all common image formats, so you are unlikely to have trouble using the image of your choice. However, at this point, a problem arises: Unless you have the foresight to open the image in another application first, the frame is unlikely to fit the image it now holds. If it doesn't, all you need to do is select Adjust Frame to Image from the context menu to adjust the frame automatically. For some unknown reason, the opposite function is not in the context menu, but you can access it from the context menu by selecting Properties -> Image -> Scale to Frame Size, after which you may need to select Adjust Frame. Often, changing the image size rather than the frame size will be the easiest option, especially if the image is larger than the frame but you need to fit the frame into a precisely-defined space. Once the image is inserted, you may want to change its dpi (resolution) by selecting Properties->Image. A resolution of 72 or 96 dpi is fine for online display, but for printing -- which is what Scribus is designed for, you want a minimum of 300 dpi. For higher quality work 600 or 1200 dpi might be preferable. Depending on your computer's RAM, adding images in a higher resolution may slow down the screen rendering of your document. For this reason, after you have added an image, you might consider unselecting Image Visible from the context menu. Alternatively, you can set Preview Settings to Low Resolution or Normal Resolution. With either item, you can always change the setting if you need to see how the image actually looks. Scribus is a layout application, not an image editor. For this reason, you can only edit in limited ways in Scribus. Almost always, the best way to adjust an image in Scribus is to select Edit Image from the context menu and open an external editor. This editor is set in File -> Preferences -> External Tools -> Image Processing Tool, and is usually The GIMP. Whatever your external image editor, it will work with the original file, so you might want to make a backup copy before making changes. After editing in an external editor, your changes generally do not show in Scribus. If it doesn't, you need to select Update Image from the context menu. Update Image is also a useful way of altering an image without deleting the original. Since Scribus links to images, instead of embedding them in documents as OpenOffice.org can do, changing the original image -- or replacing it altogether -- then selecting Update Image can be an efficient way of working, so long as the new image has the same dimensions as the original. Within Scribus, you can also apply a limited number of filters by selecting Image Effects on the context menu. You can apply multiple filters, including ones like Sharp more than once, viewing each change in a preview pane before selecting the OK button to apply your chosen settings. Filters are applied to the presentation of the image in Scribus -- and not to the original document. As you can see, the finer points of adding images in Scribus are not always as obvious as they could be. Depending on how you are accustomed to working, you may also find some features lacking; personally, I would appreciate a way to change the file path without editing the saved file. However, once you are aware of a few peculiarities, adding images in Scribus presents only mild problems. After you add or modify the first half dozen images, you will probably find working with images in Scribus presents few if any difficulties.